I’ll never forget the day my husband & I were sitting on our patio in Wylie, Texas enjoying the hustle, bustle of 4 pesky little Chihuahuas. Dallas, Woody, Murphy & Lucy were the cutest little things! They totally ruled the house! Friends & neighbors would comment on how loving & friendly our little Chi’s were and how they were not like most Chihuahuas. Amidst the puppy activity Scott said to me, “Honey, I’d really like a “guy” dog!” He didn’t know much about dog breeds & left it up to me to find the perfect pet to add to our already busy canine household. I knew right away he’d love a German Shepherd. They’re big but gentle, protective but loving and extremely smart. I found a family in Royce City, about 45 minutes away, who had a large litter of pups to choose from. We met the folks and were able to see both the dam & sire of the litter. Daddy was HUGE & scarey looking but he was exactly what Scott wanted in a “man” dog. Scott picked Sheba (her name hadn’t been chosen then) – or more than likely Sheba picked Scott & off were were to introduce this 8 week old bundle of paws & ears (she had yet to grow into those), to our clan of little fuzzbutts. We decided to name her Sheba because we’d figure she’d be the queen of the dogs in our household. Well, that was what WE figured. The Chihuahuas hadn’t agreed to that. It didn’t take long to see that Sheba was at the bottom of the pecking order and she didn’t rule… not yet! Eventually they all got along and became one big clan. I don’t know if Sheba became to think she was just an over-sized Chihuahua or if the Chi’s thought they were under-sized GSD’s but they all got along perfectly! Through the years Sheba grew into her role as family (and Chihuahua), protector. We traveled in a motor home extensively for a few years as our business led us from one location to another. 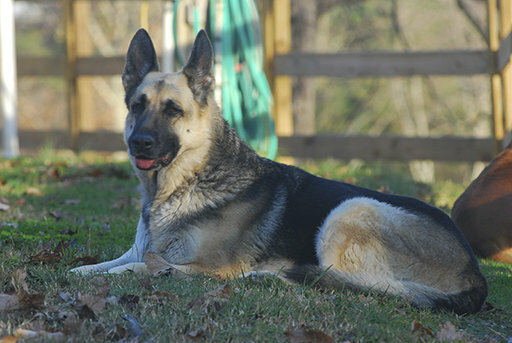 Sheba always did well and it was a great assurance to know she was always “on guard”. Of course the Chihuahuas were the “first alert” system but all it took was one deep GSD “woof” and anyone coming to the motor-home was immediately cautious. Probably the nicest thing about Sheba was her devotion & attachment to both of us. 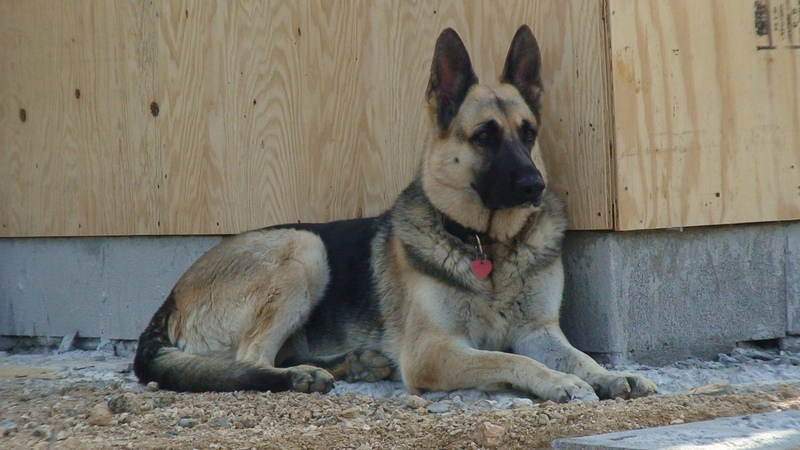 Usually German Shepherd dogs are attached to one member of the family. But not our girl. She would get very nervous if one of us left. It was like she felt she couldn’t do her duty as protector if we weren’t together under her watch. As the years rolled by Sheba just got older… Years of jumping in and out of the truck bed (her favorite place to lay whether it was moving or not), had given her arthritic shoulders. We’d often call her “Hopalong”. However, if she thought she saw something in the field, she was off! She’d love to chase the White Tailed deer but all she ever caught was the occasional squirrel. We knew Sheba didn’t have many years left with us. German Shepherds start getting old real fast by the time they’re 10 but our girl was doing pretty good. She had a great life & roamed our property at her will. She’d never been chained or restrained in any way. But she did start to slow down and became very temperamental with the small dogs. Earlier this year she mortally wounded Rocky, our 4 lbs Chihuahua. Late this summer she severely hurt Taz, Rocky’s little brother. The relationship with the 2 of them was never the same. Little Taz stayed as far away from her as he could. As a matter of fact, Taz hasn’t been the same since then! Mid-November we returned from our cruise to find that Sheba had lost lot’s of weight during our 8 day absence. Tim confirmed that she did throw up most of what she ate. We brought her to the vet who couldn’t find anything wrong with her except for a small case of roundworm and a low white cell blood count. She was on antibiotics for 10 days and seemed to do a lot better. At this time we had brought Sheba to live with us in our house – she had spent the last year living at the “office” with Angel, Taz, Mandie & the 2 cats. She took great pleasure in this “treat”. The only reason we hadn’t brought her in before was because of her incredible shedding! I felt it in my heart that Sheba was seriously ill and thought she deserved to finish her life in the house. She’d been so loyal and loving for the past 10 years, I owed it to her to live with the fur floating all through the house! She continued to loose weight and vomit everything she dared to eat. We brought her back to the vets and they kept her. They did exploratory surgery to see what was blocking her intestines (the barium radiology didn’t show anything), and only found a horribly inflamed pancreas. Cancer was highly suspected and a biopsy was sent out. The vet called Saturday and said she appeared to be doing a little better… Sheba had asked to go out. She was on different meds and the vet suggested we give her until Monday. Well, early Monday morning Dr. Bristol called and said she was going downhill fast. So Scott & I headed up there. I brought her old stinky dog blanket/bed and laid that in the truck bed. Dr. Bristol brought her out – by then she was just a sack of limp skin & bones. She’d gone from a 110 lbs dog to a barely 60 lbs dog in less than a month. As she was laid there, weak and looking so defeated, Scott started talking to her and she lifted her head and looked in his eyes and I could swear that she smiled at him. It was like when she saw him, a certain peace came to her. We had her cremated and her cremains will be disbursed throughout the field where Sheba loved to run and chase squirrels, bunnies and sometimes White Tail deer. What a beautiful memorial! The animals that we choose to bring into our lives change us forever. There’s a reason why God made us smarter than animals (well, most of us anyway!).. It’s to take care of them as He would of had. Not only is it our duty, but it is our responsibility. Nice chatting with you earlier today.. I wish we wouldn’t live so far from each other – I think we’d have a great friendship!